Ok ... so I couldn't wait. I bet most of you guessed that. 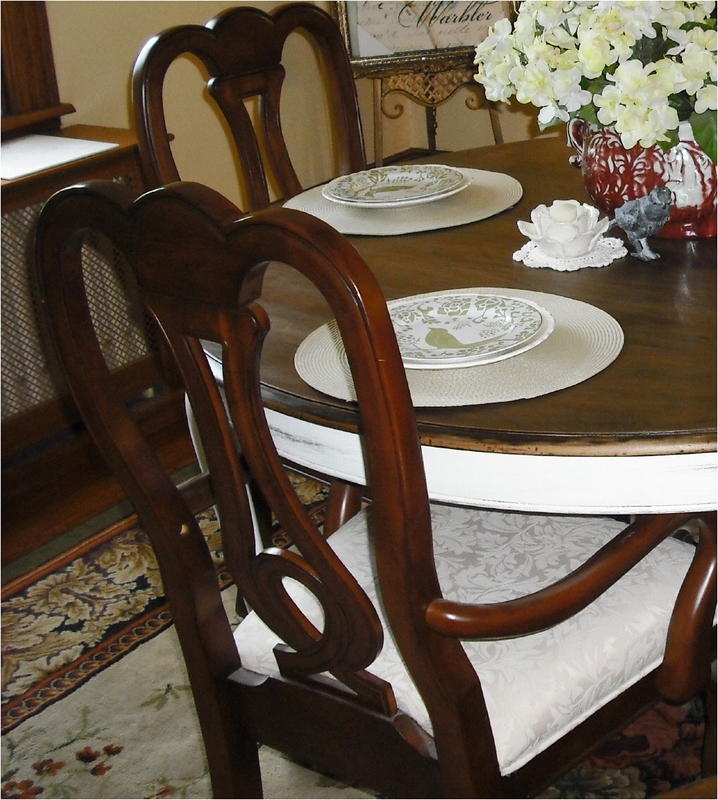 I couldn't wait for the dinning room reveal to show you the finished dinning chair. So lets just call this the dinning room chair reveal. 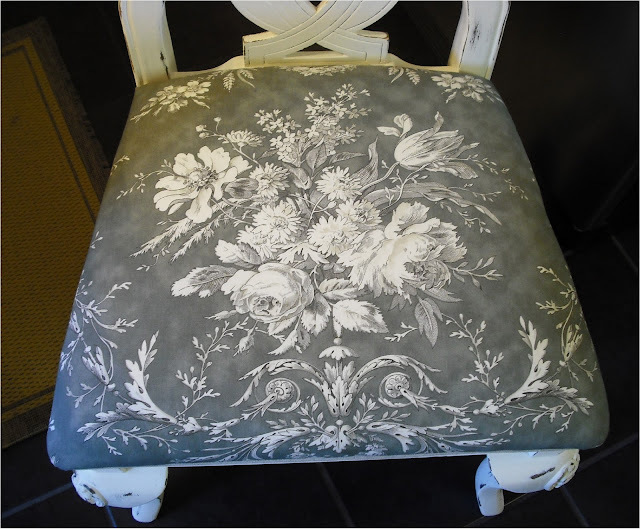 I chose a wonderful grey and cream floral ... the picture on my dinning room design board doesn't do it justice. It really pops against the antique white of the chair. I really love how your eye gets drawn to the light colored floral on the seat, I think that is what makes it work so well with the new finish of the chair. one more look at where this chair started. 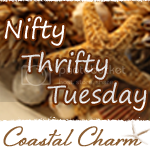 Sometimes being thrifty really pays off. I don't even think I recognize this chair any more. You just have to love paint ! It is going to be real hard slip covering over this chair for spring and summer... ok who am I kidding ... Its just a slip cover and I will most likely enjoy the versatility. I hope you like the change as much as I do. For all those who asked about the fabric ... It is an Ethan Allen Fabric, Alaura Charcoal . Love the chair!! The fabric is perfect, too! They look great! I love the bright white legs! They look great with that fabric! Absolutely marvelous! I am in LOVE. And I'm your newest follower. What a lovely chair! Good job! Great fabric and you did an awesome job! Beautiful fabric and great job Newbie!!! Love this party don't ya! Now you're making me want to paint mine! Looks great! That turned out just lovely and that fabric is gorgeous! Your right I never would of guess that the before and after are one in the same. The after is really fabulous. Came here from Debbiedoos and I'm a newbie also. I'll be following you. The chair are lovely and you made a really nice fabric selection choice. Nothing like a beautiful chair makeover. It looks fantastic. Thanks for sharing with my newbie party. Love the chair makeover! I've been putting off doing mine. Thanks for the inspiration! Really beautiful fabric! I love the makeover! Oolala! What a fantastic transformation :) Great fabric choice too! Stop by for a blog visit your newest follower. Beautiful!! 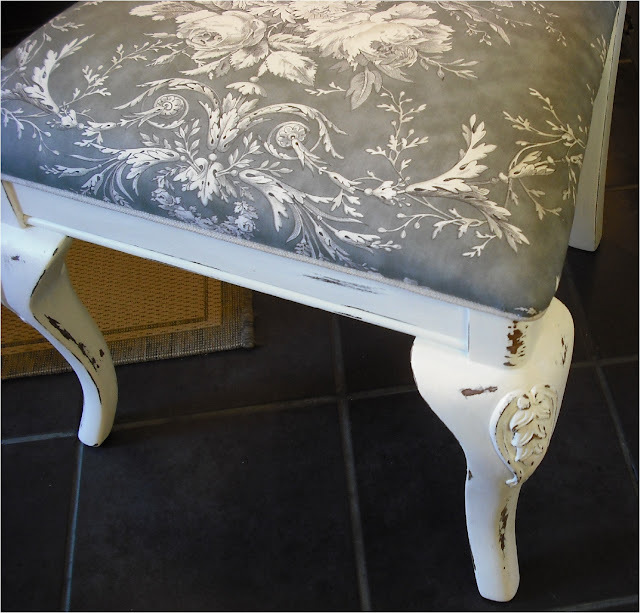 LOVE the fabric and the paint!! It is such a great transformation!! I can't wait to see the rest! I love that fabric! It compliments the color on the chair beautifully. Lovely job on the chair I especially like the fabric. Thanks for sharing. 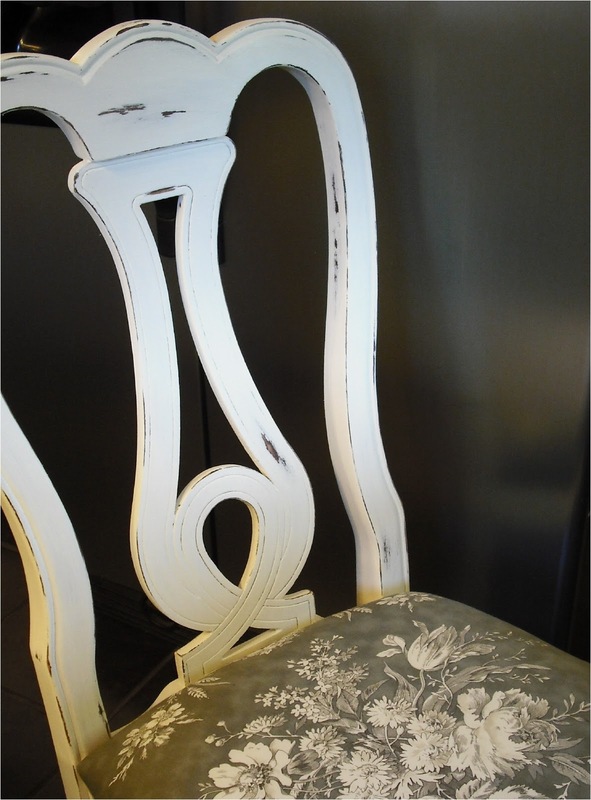 The chair is beautiful--I want that fabric! Oh so beautiful and I adore the fabric. Where can I find this fabric? Wow! That fabric is gorgeous! Good pick. 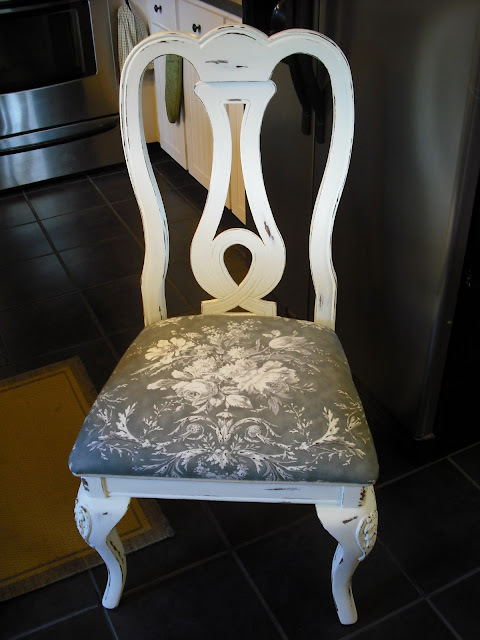 Your dining room chair is gorgeous...love the colour...LOVE the fabric! Loved the fabric that you picked, the chairs came out great! Chairs look amazing - love everything about them! Thanks for the info on the fabric. Were you able to order through Ethan Allen or did you use another resource? I hardly recognize your chair, either! It looks terrific! I love anything gray! Can't wait to see the completed room! Wow! This is so pretty! Hope to see you at My Dream Canvas. Thanks for leaving your sweet comment! 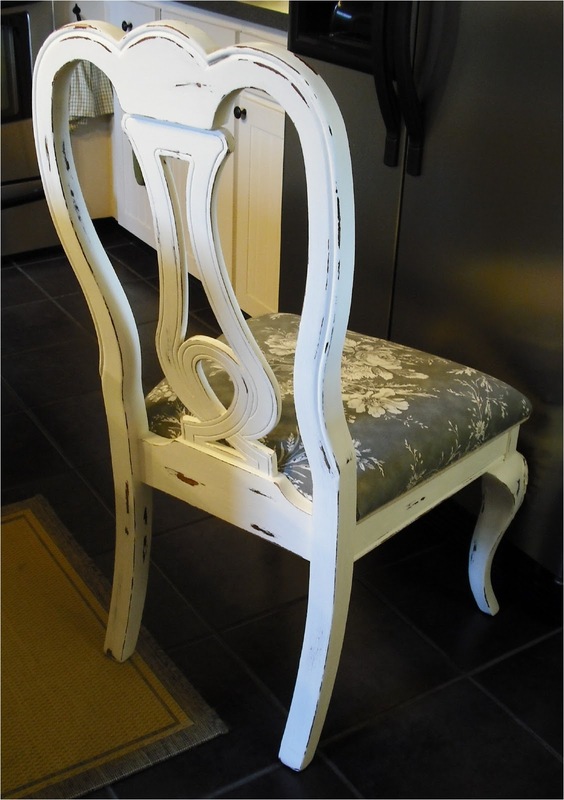 I love chair makeovers and this one is GORGEOUS! The paint and fabric are perfection! OM goodness, this fabric is divine, so beautiful! 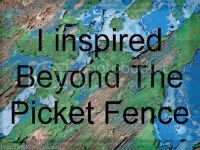 Thanks for linking up at Beyond the Picket Fence. You did a fabulous job! L.O.V.E. 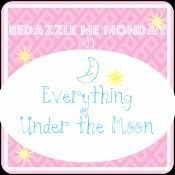 Thanks so much for linking up to Motivational Monday's at threemangoseeds.blogspot.com. Thanks for your sweet comment on my blog! Your chairs turned out beautiful! I am your newest follower! The chair has turned out beautifully. Thanks for stopping by my blog Francine! I love the chair! I'm about to reveal mine soon. We're both redoing our dining rooms with white furniture. I'm following you now and look forward to seeing your progress! 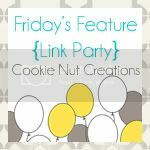 I'm stopping back by to say thanks for linking to Potpourri Friday! Your participation is appreciated! Hope you will every week! Wow, a total change! You did a wonderful job on your chairs! Just lovely. Great choice of fabric. 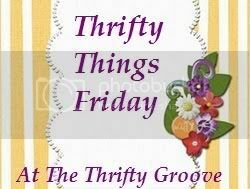 Thank you for being part of TTF and have a fantastic weekend!! 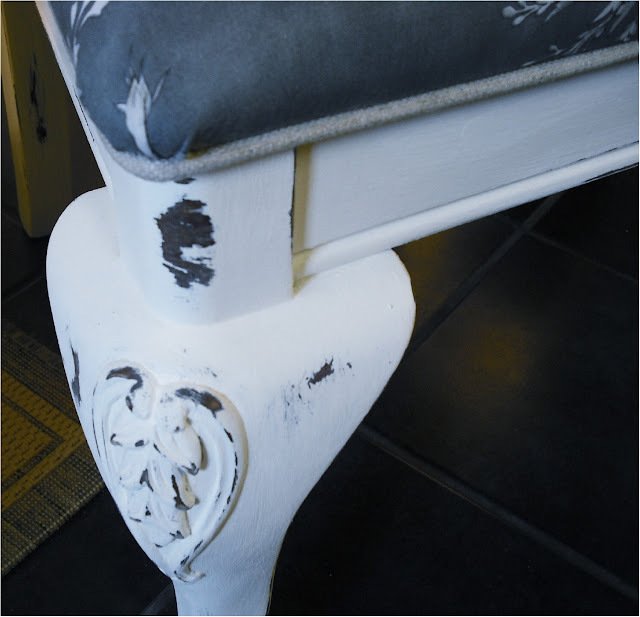 What beautiful chairs & what a great blog. 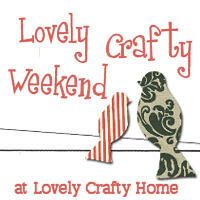 I enjoyed stopping by! Gorgeous fabric and your dining chairs look great painted and distressed. What a beautiful chair. It is so elegant, I love it! I’m purchasing set this weekend with the sole purpose of customizing it for my beach decor. This post is very inspiring and will help me through my project. I’ll post pictures once I have it done. I’m super excited to get started. Thanks for sharing. LIGHT-IN-BUG PILLOW . . . . Original design by me that you can customize for that special Someone! Check them out! Along with gift wrap and wallpaper!